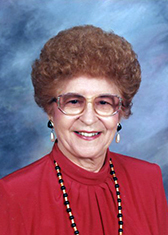 Ruby Lee Deering, 94, of Nederland, died Thursday, March 28, 2019, at Bonne Vie, Port Arthur. She was born September 20, 1924, in Zwolle, Louisiana, to Julia Martinez Cordova and James Cordova. She was a substitute teacher for sixteen years with the Nederland Independent School district and she taught Sunday school for five years at Providence Church of Nederland. Ruby enjoyed going to McDonald’s every morning to eat breakfast with her friends. She always loved her flowers and going dancing. Survivors include her daughter, Bonnie Nagy and her husband, Tim, of Cabot, Arkansas; son, John Deering, of Kyle, Texas; sister, Virginia Brown and her husband, Glen, of Stonewall, Louisiana; sisters-in-law, Wanda Cordova Stephens and Carolyn Cordova; and many nieces and nephews. She is preceded in death by her parents, Julia Martinez and James Cordova; husband, Clarence Walter Deering; brothers, Gilbert James Cordova; James Thomas Cordova; Joseph Roy Cordova; and Huey Paul Cordova; and sisters, Birdie Ezernack; Lena Siller; Dorothy Bebee; and Ida Byrd. A gathering of Mrs. Deering’s family and friends will begin at 12:00 p.m., with her funeral service at 2:00 p.m., Thursday, April 4, 2019, at Broussard’s, 505 North 12th Street, Nederland. A family committal will follow at Oak Bluff Memorial Park, Port Neches. Wanda, Binky, Barry & Michal, Bryan $ Judy..Your Amarillo people. My how Mom will miss your talks on the phone, Ruby really was a Ruby, a precious jewel of a person, Some called her Red! The earth lost sparkle that day but heaven is brighter for it, so sorry John and Bonnie, but you had her a long time, not enough, before the Lord took her home. Ed, especially loved Aunt Ruby when she welcomed him into the family, after Dad's death. She said to Ed, " If anyone gives you any trouble around here, you tell me", we all remember that! She was and always be a feisty woman! Sorely missed by so many, but always remembered. Ruby was a,dear friend of my mother Joan Silva, whom just passed on February 19th 2019. They loved to go eat their steaks at Roadhouse. Mom loved Ruby and so did I.
Bonnie and family, I’m sorry to hear about the loss of your mother. I remember her from Sunday School at First United Methodist, in Nederland, when we were young children. Prayers for comfort and peace during this tome. Thinking of you. So sorry to hear about your Mom. I have fond memories of her and enjoyed being neighbors with you all. So sorry to learn about the death of your mom. We met years ago when she kept our nursery at Wesley UMC. She was very special. She was friends with my mom, Odessa, and they did enjoy dancing. Mom, we love & miss you so much. John and family, my prayers are with you during the loss of your mother. May you find peace in her sweet memories you have. It is hard to lose your Mother, the only person that loves us unconditionally. From the beginning of my memory, there was always Aunt Ruby. She always had the prettiest dresses that I had ever seen. Her hair was always pretty red curls with red lipstick. and rouge. Aunt Ruby was a true southern belle. We will miss her forever. But speak her name and she will never be forgotten.